Despite being just 21 years of age, Ferrari prodigy Charles Leclerc carries himself like a Formula One veteran. As Laurence Edmondson discovered, that probably has a lot to do with the youngster's remarkable career journey to this point. After Charles LeClerc and Lewis Hamilton set their fast times, Sebastian Vettel goes to the top of the leaderboard in China. Sebastian Vettel arrives at the third race of 2019, the Chinese Grand Prix, under increasing pressure after another high-profile error in Bahrain. The four-time world champion is confident of kick-starting his campaign in Shanghai. Mercedes boss Toto Wolff says Ferrari is the clear favourite to win the Chinese Grand Prix due to what he feels is an unmatched level of performance from its engine. Charles Leclerc will use the engine which cost him victory in Bahrain at the Chinese Grand Prix. Whatever may or may not happen to Mick Schumacher during his first F1 drive this week, it will not be a patch on the extraordinary events surrounding his father Michael's debut in August 1991, recalls Maurice Hamilton. Ferrari has confirmed Charles Leclerc's loss of power at the Bahrain Grand Prix was a caused by a cylinder failure. Sebastian Vettel apologised to Ferrari for the spin Sunday that ultimately cost him at shot at winning the Bahrain Grand Prix, but insisted the mistake had nothing to do with struggling to handle pressure. 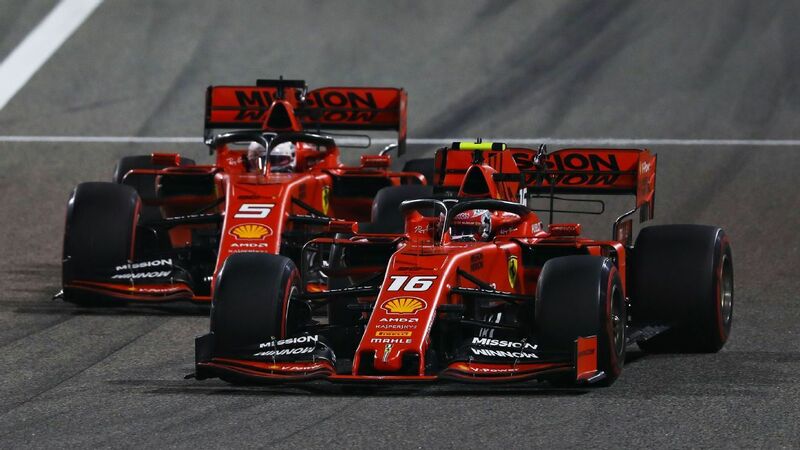 Ferrari says Charles Leclerc will be allowed to fight teammate Sebastian Vettel for victory in the Bahrain Grand Prix on Sunday, as long as he does not take any unneccesary risks doing so. Charles Leclerc's maiden pole position at the Bahrain Grand Prix will have given Ferrari a headache over what it does with its young wonderkid and his teammate, Sebastian Vettel, who will start from second on the grid. Ferrari may have clocked a much faster pace than Mercedes in Friday practice, but don't be fooled. The Bahrain Grand Prix looks set to be closer than the raw lap times suggest. Sebastian Vettel says Ferrari's decision to tell teammate Charles Leclerc to hold position behind him at the Australian Grand Prix was not a "strong team order" and was overplayed in the media.